What is Good Posture Anyway?? Posture refers to the position in which you hold your body upright against gravity while standing, sitting, or laying down. 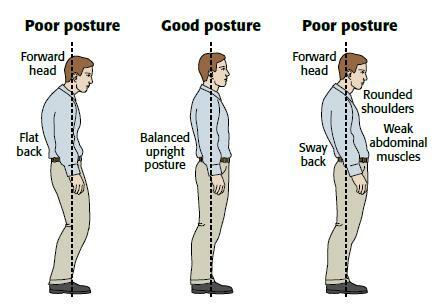 The ideal posture for an individual is achieved by training your body to stand, walk, sit and lay in positions where your spine is in the most neutral position possible, resulting in the least amount of strain being placed on the supporting muscles, ligaments and joints – this is important for all activities involving both sustained postures and also those involving movement! Keeps your spine and joints of the body in an ideal anatomical alignment so that your muscles are being used properly and efficiently to support your body. Helps to decrease abnormal wear and tear of your joints and spine, which also helps to reduce the chance of arthritis or degenerative changes. Decreases stress on the ligaments which hold the joints of your spine together. Prevents your spine from adopting abnormal fixated positions and abnormal curvatures. Prevents fatigue, as your muscles are actually being used more efficiently, which allows your body to use less energy overalll. Prevents strain and overuse injuries. Prevents shoulder ache, back pain and muscle tension. Gives your internal organs room to function normally. Allows blood to circulate freely for optimal overall fitness and well being. Choose chairs that are firm with straight backs and lumbar supports, when possible. If your chair does not have a lumbar support, a small rolled-up towel or sweater can also do the same trick! Keep your back flat, engage your core and have your hips bent to 90 degrees with your feet resting flat on the floor. Your knees should be bent to approximately 90 degrees, or just every-so-slightly higher than your hips. Your legs should not be crossed. Propping your feet up on a footstool or leg rest is acceptable for increased comfort so long as your keep the above guidelines in mind! Try to avoid sitting for more than 30 minutes at a time without getting up to stretch. At work, or if seated at a desk, adjust your chair height and work station so you are sitting up close to your work and not straining to reach what you have to do. Rest your elbows and arms on your arm rests or desk, keeping your elbows bent to 90 degrees, but shoulders still relaxed. If sitting in a chair that pivots and rolls, do not twist at the waist, ever! Instead, turn your whole body – this keeps your spine neutral and prevents injury and repetitive strain. When standing up from the sitting position, move to the front of your seat. Stand up by pressing both heels into the ground equally, engaging your glutes and using your hips and leg muscles to bring yourself upright. Avoid bending forward at your waist. Stand with your feet shoulder width apart and weight distributed evenly between both legs. An imaginary line dropped from your ear should go through your shoulder, hip, middle of your knee and your ankle bone. Your lower back should be flat and never arched backwards or slouched forward. Standing for long periods of time can put a lot of strain on your back. If you do need to stand for prolonged periods, occasionally shift your weight from one side to the other, while still keeping your spine relatively flat. Propping one of your feet up on a step 6 to 8 inches high is also a great way to alleviate some of the strain on your spine. Wearing proper supportive footwear and standing on a pressure-alleviating mat are also great ways to prevent strain while standing. Sit close enough to the steering wheel so that your lower back remains flat and perpendicular to the floor. Your hips should be bent to approximately 90 degrees and your knees should be at the same level or again, ever-so-slightly higher than your hips. Use a lumbar roll or other back support to protect the curve of your low back. You should not feel any strain in your back when your feet go to reach for the pedals. Make sure you have firm footing and stand with a wide stance close to the object you are trying to pick up. Squat directly in front of the object to be lifted, keeping your back straight and bending at the hips and knees. Tighten your core by bracing your abdomen (“flexing” your abs!) and grasp the object with both arms. Rise slowly, letting your hips, legs and thigh muscles do all the work. Keep your core right and spine flat at all times! Never jerk the object up or perform any sudden movements. Keep the object you are lifting close to your body and do not twist. To lower the object, place your feet as you did to lift, keep your core tight and slowly lower by bending at your hips and knees, but still keeping your back flat at all times. Never try to lift anything that you can’t easily manage – ask for help! Sleep on a firm, flat mattress that is properly supported and does not sag. No matter what position you sleep in, your pillow should be under your head, but not your shoulders, with a thickness that allows your head and neck to remain in a neutral spine position. Your neck should never feel wrenched to the side in any way. Sleep in a position that allows you to maintain the natural curve in your back. Side sleepers: Keep your knees and hips bent, pillow under your head as well as in-between your knees. Using a large body pillow to support both your knees and arms can also be very comfortable. Back sleepers: Use a pillow that keeps your neck neutral so that it doesn’t rotate to the extreme left or right while you sleep (i.e. a cervical pillow or a pillow with a bit of a dip in it that cradles your neck). Make sure your pillow isn’t too flat such that your neck falls into extension, or too firm such that your neck is forced into extreme flexion. If needed, try a pillow under your knees, lumbar roll or small towel rolled up under your low back to reduce any strain. If you must sleep on your stomach (not ideal! ): Place a pillow under your hips to reduce the increased curve in your lower back. Gently stretch your neck in the morning as it will probably have been rotated in an extreme position stuck to either the left or right for the whole night! Cautious tip – watch out for waterbeds! Although they may seem comfortable in the short term, many waterbeds do not offer the proper support your back needs in the long term. When standing up from a laying down position, turn onto your side, bring both knees up towards your knees slightly and slowly swing your legs forward toward the side of the bed. Sit up by using your arms and hands to push yourself upward. Tighten your core and stand up using your hip and leg muscles. Avoid flexing your spine and bending forward at your waist. We hope these tips help to keep your spine healthy and posture beautiful! For any additional questions, feel free to book in with one of our Toronto back pain treatment specialists today!